me and him: An update, it's Valentine's time, and I've made you a bouquet. An update, it's Valentine's time, and I've made you a bouquet. An update: Jason is doing better. After quite the bumpy road with stomach problems since the Nissen Wrap, he had a crazy turnaround right after the new year and has been gaining weight and getting stronger. During our appointment with the specialist we learned (from biopsies from his bronchoscopy on last Tues) that he has no rejection and no antibodies. His lung function tests are trending upward too with a 73% on the latest! This is great news! With this type of behavior we looking at moving back to the westcoast mid–late February. BUT! we are well aware that we are not the ones in charge and our plans have had a habit of changing... so I guess we'll just have to wait and see. I like Valentine's Day. It's a favorite. Sure it's full of love and chocolate and stuff—but I like it mostly because it breaks up the sad, dead rest-of-winter months and makes life a little bit brighter and bearable amid the brown grass and leafless trees. And that makes me happy. 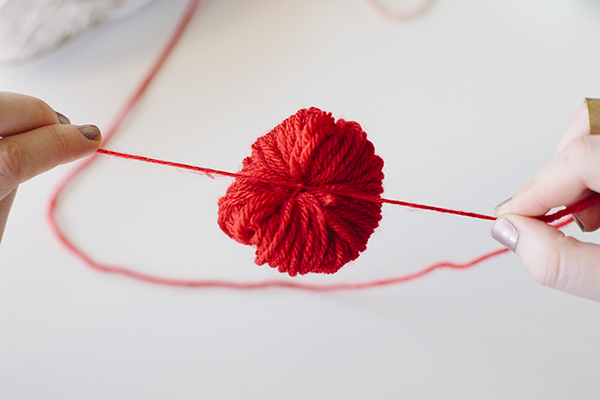 For some reason unbeknownst to myself, I also get the urge to create something around Valentine's time. Preferably something bright and preferably something cheerful (here, here). 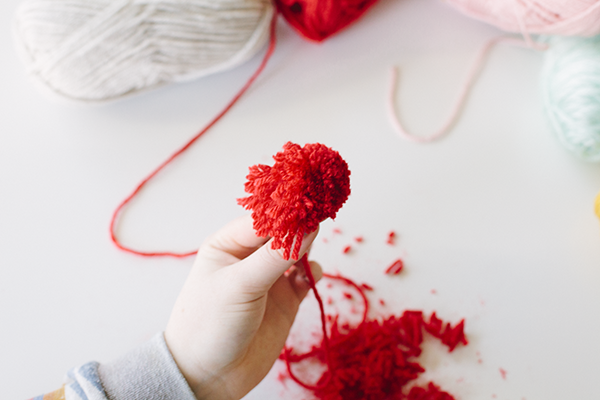 Maybe two weeks ago my sister Cassie sent me an email with this little project idea, largely because she knew of my affinity to pompoms as of late. She was correct in assuming I would fall in love and start collecting twigs straight away. So pompoms. They're ridiculously easy to make. 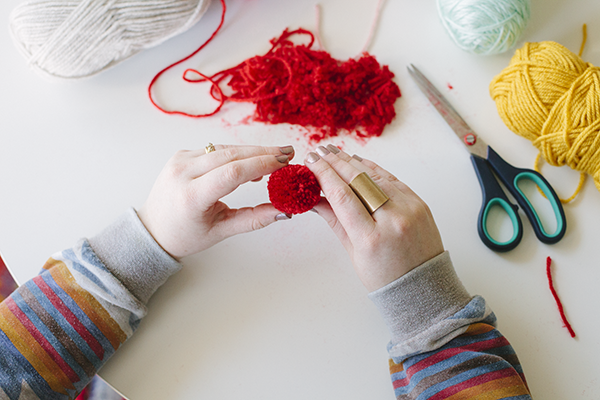 You can buy pompom makers if you would like, or you can cut up cardboard and create your own pompom maker... while those things have their place in pompom-making, you can make it real easy on yourself and just use your fingers because they're just hanging out, doing nothin anyway. 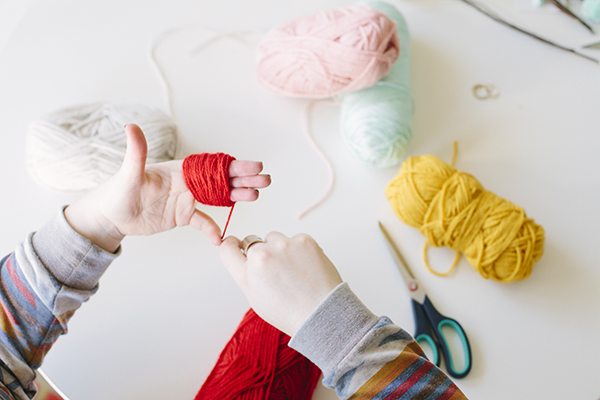 Wrap yarn around three fingers 90 times for smaller pompoms. 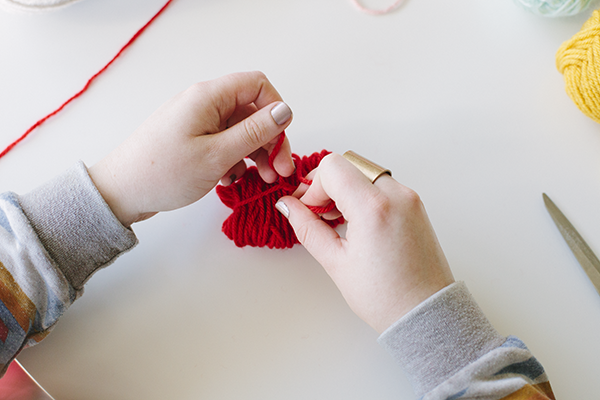 Wrap around four fingers 115 times for a little larger pompoms. Slip from fingers and place wound yarn on string. Tie string nice and tight. 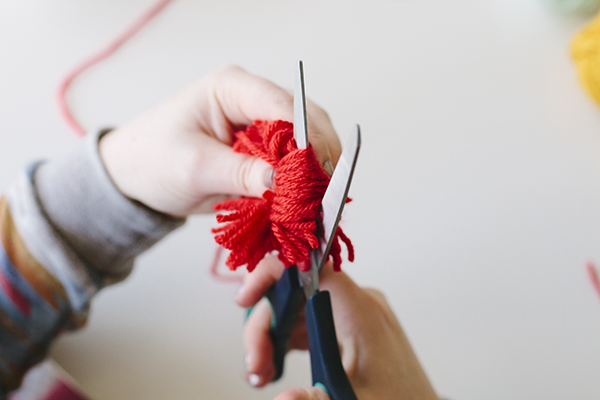 Slip scissors through yarn loops, and snip snip. Until nice and round and pompomie. For a bouquet collect some awesome twigs outside. 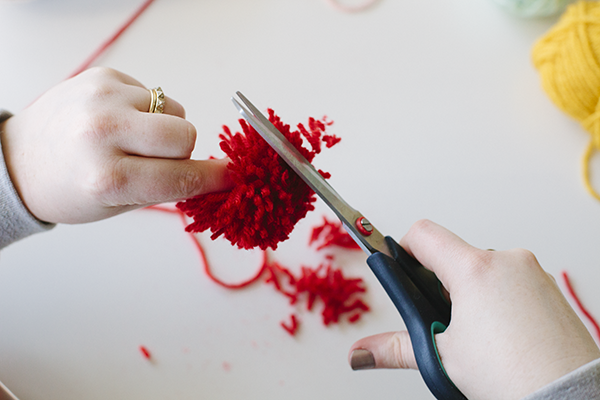 Dab some hot glue on the tip of the twigs and insert into the pompom. Let set for a couple of minutes and ta–da! 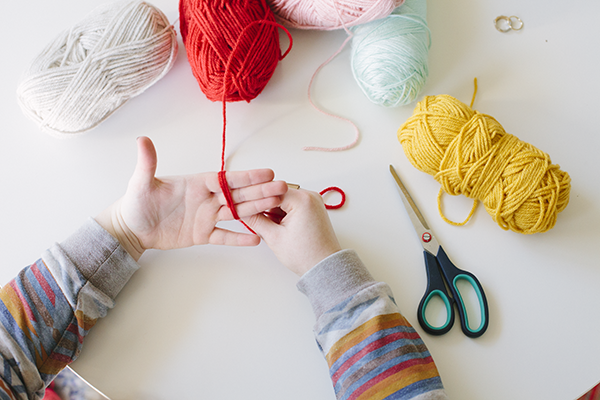 I love this--the simplicity and the colors you used! I can't wait to make some! Thanks for sharing! So cute love it!!! More importantly so glad Jason is doing so well! Such a blessing! This is adorable! And you have a new blog layout - It looks great! 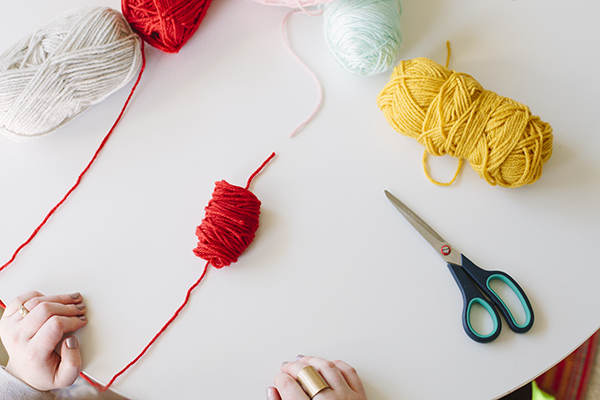 Pom poms are cute, by the way. I'm so glad you made them!! They are darling. I think we'll have to make some too. Good times are coming...I can feel it. Fantastic news!! 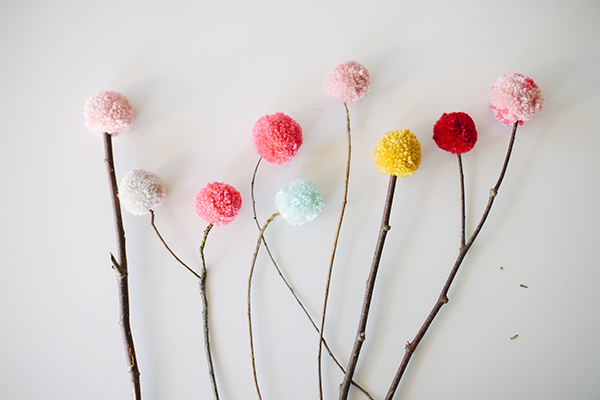 Adorable pompom flowers!! So glad that things are going better. Keep it up.